The escalation of the Taser debate resulted in a rally in Malcolm X Plaza Friday, where students protested against what they see as the silencing of student voice on campus. 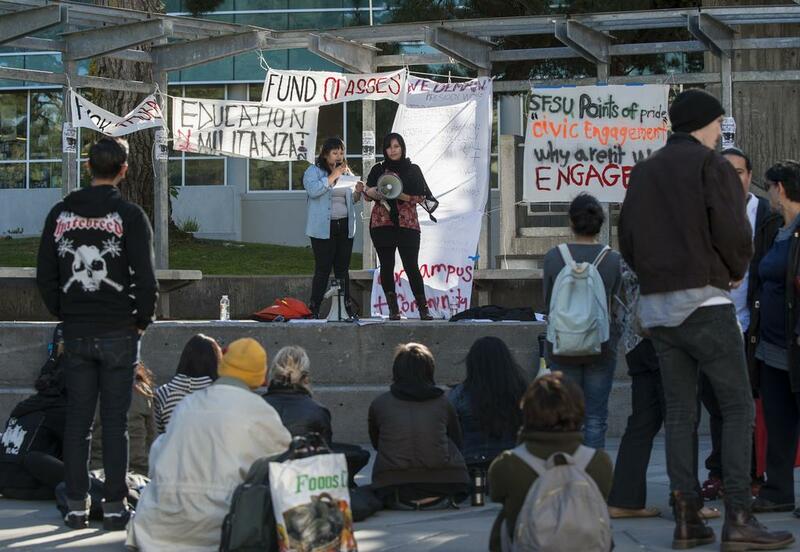 Protesters also spoke out against the auxiliary merger between Associated Students, Inc. and the Cesar Chavez Student Center that threatens the benefits for some SF State employees. “We are here for Tasers, but this comes into a bigger context — there is no student voice,” said Mazin Mahgoub, one of the event’s organizers.”This is an attempt to bring these issues to light,” he said. SF State Dean of Students Joseph D. Greenwell attended the event and was called out by members of the audience, where he was urged to initiate a conversation with President Leslie E. Wong on behalf of students. The audience asked that he present Wong a list of their demands. “I am happy to convey the information to President Wong, but I cannot make promises on someone else’s behalf,” Greenwell said. Students held that it is his responsibility as the dean of students to bring their concerns to Wong’s attention. Mahgoub read a tentative list of demands to Greenwell, which included stopping the implementation of Tasers, increased transparency from the University on the matter and a request that Wong issue a community vote before making a decision on the Taser issue. “I can commit to organization, but not to issuing policy,” Greenwell said. Greenwell also said he would make a commitment to bring the questions to President Wong. Since the general assembly Thursday, Nov. 14, students have expressed concern that Wong would likely sign the general order for Taser implementation during either Thanksgiving, or winter break. In an email to Xpress, President Wong assured that this was not going to be his course of action. “I do not make decisions over holiday periods when staff and students are away. I will likely finish up my homework by Dec. 30, and make a decision when students return,” Wong said. Student activist groups in opposition to Tasers are currently drafting a more concrete list of demands for President Wong, and intend on continuing rallies in opposition throughout the remainder of the semester. I happened upon this protest last week. Quietest protest ever. Gathering of 20 or so were attentive, but quiet. I know tasers are not that big a deal but come on people represent.